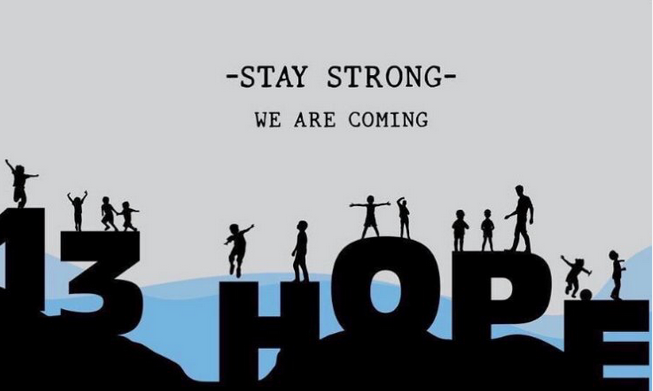 Thailand Cave Rescue - Stay Strong - We Are Coming! Before updates on today's resumption of the rescue operation, here's an overview of what happened on Sunday. The four boys that were rescued on Sunday have been transported to a hospital in Chiang Rai in northern Thailand, about 60km away, witnesses told Reuters news agency. Narongsak Osottanakorn said that doctors would decide on family visits "at a distance or through glass." Initial reactions have been positive in response to the first phase of the rescue operation, with most people "amazingly happy" about the four boys rescued so far. Al Jazeera's Scott Heidler said families are still concerned. The young boys and their coach have been surviving on "chips and water," Heidler said, according to a woman who sold them snacks before they headed to the cave complex. Sunday was the day "we have all been waiting for," Chiang Rai Governor Narongsak Osottanakorn said at a press conference on Sunday after four boys were saved during the first phase of a rescue operation. The path is a difficult one to navigate. To exit the cave, the remaining boys, who are likely malnutrition, are expected to dive a narrow passage, which is 0.6m deep. Rescuers resume their operation to extract the remaining nine members of the Wild Boars football team out of the cave on Monday. Rescuers work to replenish air supplies inside the cave. The four who were rescued on Sunday have not been named yet. Not even the parents have been informed. Schoolmates pray next to a banner showing the team who were trapped at Mae Sai Prasitsart school on Monday morning. Classmates react after a teacher announces that some of the boys have been rescued at Mae Sai Prasitsart school. The boys that were rescued from the cave on Sunday are strong and safe but need more medical checks, Thailand's interior minister said on Monday morning. Anupong Paojinda said the same divers would carry out the next part of the operation, AP news agency reported. A security officer walks out of the Chiang Rai Prachanukroh hospital where those who were rescued from the flooded cave are being treated. The rescue operation to extract the eight boys and their coach from the cave resumed. A Thai navy officer also told CNN divers had re-entered the cave. "The operation has begun, and it is ongoing at the moment," CNN quoted the officer as saying. The second phase of the rescue mission got underway at 11 am local time (04:00 GMT), Thai officials have told a press briefing. Chief of mission Narongsak Osottanakorn said he hoped for "good news in the hours ahead." The Chiang Rai governor said overnight rain had not changed water levels in the cave where the boys are trapped. Rescue workers in Thailand were seen carrying a person on a stretcher away from a cave and into a waiting ambulance, a Reuters witness has said. Divers re-entered the Tham Luang cave to extract the remaining nine members of the Wild Boar football team at 11 am local time (04:00 GMT). "It sounds like a very speedy recovery … It's only five hours after [divers] got in that this first boy has emerged," Vaessen said. With the three latest rescues, just five more members of the football team trapped inside the cave. Four members of a youth football team and their coach remain trapped in a cave in northern Thailand as rescuers enter the second day of an operation to extract them. I hope they get the remaining 5 out quickly. Thank you for continuing to report on this story. What a story Lexy. Surely everyone who reads this will be in support of the Herculean effort of the World to save these lads. Godspeed!